The new crew had a fundraising crash course, took their places on the set, and are waiting for your calls! Look at those pros all poised and ready to go! Who would ever guess they got here less than 48 hours ago? Let's honor their good efforts and willingness to dive right in head first by making some donations! We've got a $500 match on the table waiting to be met. Care to help the cats and kittens out by making a contribution and getting us one step closer to maxing out the match? Please visit our fundraising page to learn more about our campaign and make your tax-deductible donation. Thanks! They did less destruction than the Fellows did on their first day! You're just teasing us, Laurie; these kittens have been hypnotized so they'd behave so well, right? Just kidding, obviously! 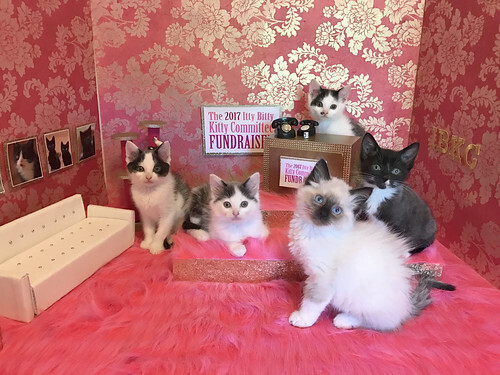 But oh my gosh, they are THE best-behaved bunch of newly-arrived fosters I have ever seen ANYWHERE, and I look at a lot of cute kitten sites (because, after all, what's cuter than kittens and other baby animals?). Obviously your Kitten Magic powers are extra-strong with this batch! And that's not even discussing their EXTRA-adorableness, with their varieties of floof and extra toes! I'm really looking forward to getting to know this batch -- you hit the jackpot at the shelter, obviously!